Today is a great day. It is good to be alive and thinking creatively. Summer is almost over, and now it is time to get back to crafting! 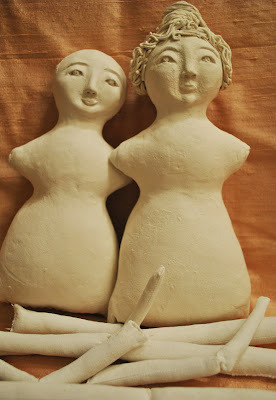 I began some cloth and clay dolls earlier in the summer, but was only able to work a little on them now and then. Below are photos of that process. I have now finished my first doll (the other doll seems to be turning into an aging Marie). Meet Flora, Flora Eliza Dewberry, she is a lovely proper girl. She tends to be quiet and keep to herself, unless she is talking about books, then her true nature is revealed in her thrill of a story. She just can't help herself! This passion of hers really shows in the bright red ribbons she has tied to her shoes. It always comes out somewhere, doesn't it? The next photos show a little of how she came to be. First I sewed the body, legs and arms from fabric. Then I applied Paper clay, and eventually sculpted a face. 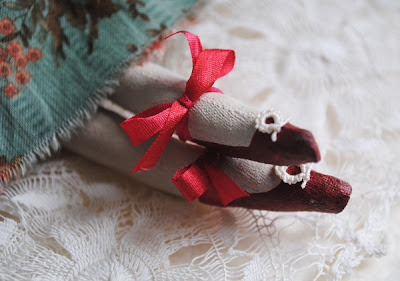 I learned how to do this over at Cloth and Clay Dolls. Here are the two girls before assembling and before painting. The video class at Cloth and Clay dolls explains how to do all the steps. It is a unique feeling making these little ladies isn't it? I have to admit that when I was finished my first girl I cradled her and cried! Yes I really did, weird I know but that's me! I can hardly wait to see the other little lady all done up! Ooooh! I love these, Terri! You're inspiring me to try this. My mom's an amazing dollmaker, and my daughter is following in her footsteps, but I've yet to give it a try...but I love what you've come up with! 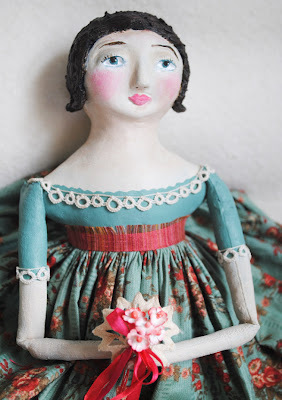 They remind me of Frozen Charlotte dolls--love them! Thanks for sharing & inspiring me today! Terri I am so impressed. I love it! I can usually pick up any craft and run with it but this looks like you have to have A LOT of natural talent! I think Flora is Beautiful!!! Terri!! Oh my..These are Fab-u-lous!! Gorgeous enchanting souls! Awesome!Wonderful job..you must be thrilled ..they are so lovely!! Terri, these are absolutely beautiful. You are a true artist with doll making. They're so delicate! I'm mesmerized by these! Oh Terri I am in love with these little beauties and they reflect the love you put into creating them. Ohh so lovely, creative and serene...I enjoy your pages, thanks for your kind words. Come back to visit again. I forgot to say, my mother used to have dollies like yours, they were made of some kind of paste, I left one outside and it rained...you can imagine the drama of finding the face half way gone. We buried it in my grandmothers garden, from that memory was born my series of fogoten garden dolls. I will post them soon. They are SO cute!! I wanna try this now!! Your dolls turned out great Terri. I really like them. I think the molded and sculpted dolls are easier for me, than a simple cloth doll, because of the hair. My friend Liisa, who has made and sold a great many wonderful dolls over the years, explained to me, that it is about scale. It is much harded to scale most materials to the smaller size of a doll, but I think your "Marie" doll turned out very nice with her goats hair. Dollmaking is so rewarding, I think. I love Flora's story. Lucky you! I looked back to catch up on your posts and saw the Mona Lisa. I'd truly love to see her, as I had heard how small she is a number of years ago. I was so surprised. I had always imagined her to be larger while I was growing up and as a young adult. Truly one of those larger than life sorts, I suppose! Your new dolly is just absolutely beautiful. A very proper girl indeed! You have such a talent for giving life to your beauties and making them so special. Happy September to you! How fabulous! I just love these! You are very talented. Terri, These are incredible dolls! You really learned well from your learning on line. They have a lot of personality...plus they are beautifully made. I might have to try this, too! I have seen your face so many places...I am glad to finally see what you do! In fact, I am going to go look again because I am sure you do many other things! Ohhhhhh Terri, you did it, you finished one and she is soooo beautiful :) Thanks for the inspiration, mine is still in the cloth stage after all this time I just can't seem to get into it. 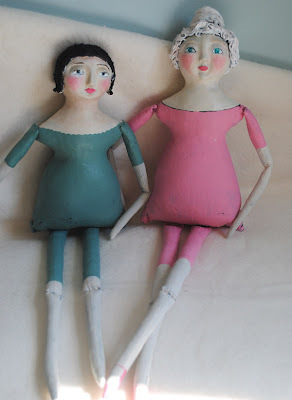 Terri, I adore your dolls! I haven't completed mine yet but now that I've seen yours, I'm so ready to get back into finishing it. WOW...those are some fabulous first dolls with your new process! How I love them both. And equally precious is the bio. Darling. Wow Terri these are soooo cute tfs! Hi Terri, these are fantastic! 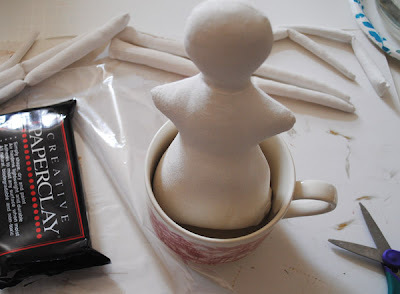 I would have never thought to apply clay over cloth dolls. Thanks for all of the information. Your doll is beautiful beyond words. What a talent you have for this! Lovely way to start my day! I'm working on an "odd doll" of various parts combined and it is a first for me. Wish me luck and thanks for keeping me inspired! These are so fun Terri! I haven't tried the clay and fabric yet. it sounds complicated, Can't wait to see how your Marie comes out. I finished a Marie doll too, just haven't shared her yet! Terri, your dolls are so pretty. I love Flora, she's a beautiful girl, and I love your sweet description of her. Your dolls are wonderful! Can't wait to see what you come up with next and thanks so much for your kind words. Flora is perfect...adorable! You must be proud of her. I loved making my Grace...even though she is far from perfect and her face is a bit wrinkly, lol !!! I´m really impressed with your dolls,you are an artist! You are so creative!! I love your dolls!! What totally adorable little ladies you have created...I think I might have to explore the doll medium farther...Thank you for sharing them. Hi Terri, WOW...I totally love your beautiful doll, so precious. Hope you have had a wonderful summer. What a lovely doll. I have made a few dolls in the past and always thought I would get back to it some day. 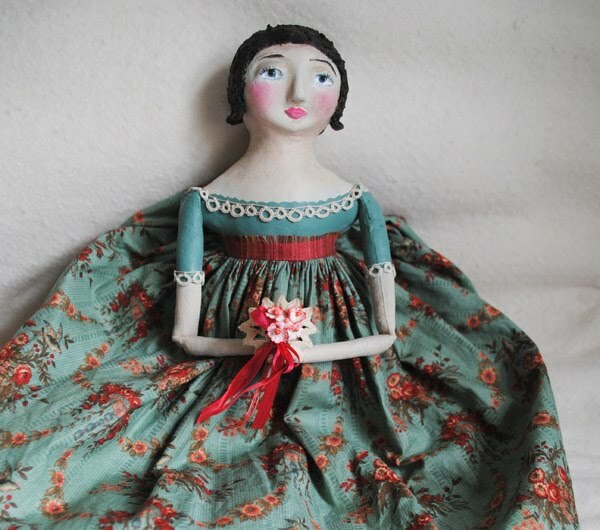 Your doll is just beautiful and you have inspired me to want to try again. I´m impressed with your dolls. Both are adorable! Great job!! !